I met Jane Irish at Locks Gallery to discuss her work a few days before the closing of her show, Faience and Firenze. This is a particularly exciting time for her because she is retiring from her position at Penn, where I first met her as a student, to focus full-time on her art. 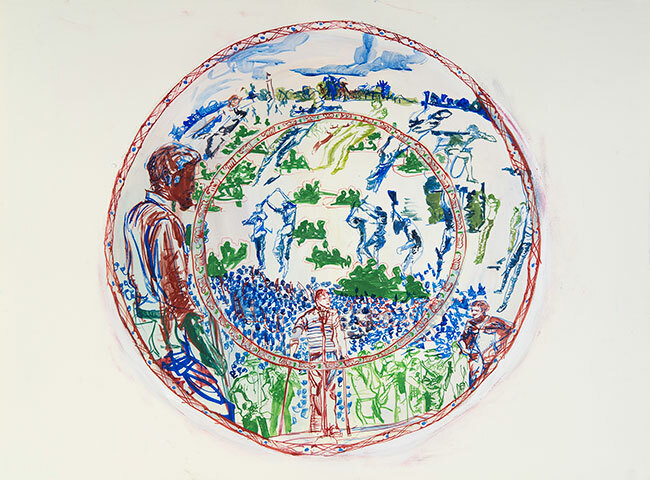 I am drawn to the way Irish works, painting en plein air and creating her own source material to remake on ceramics and large canvases. This allows her to re-see, and therefore rework older material to make it new again––to make the past relevant in a new way to the present and to develop new connections between people and places. 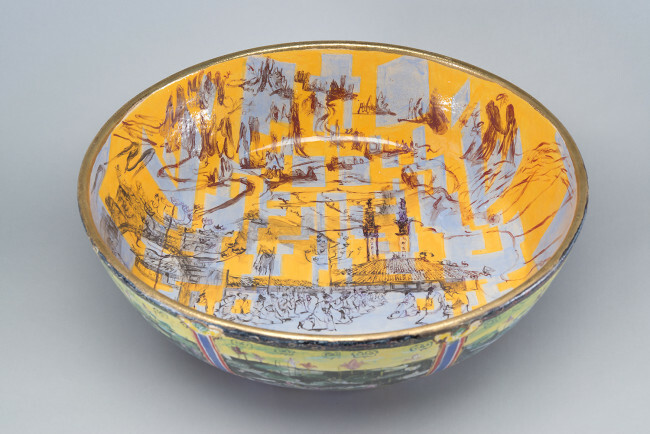 The work in Faience and Firenze consisted of en plein air paintings from Florence, ceramic bowls, and several larger canvases painted with the natural light in her studio. Gordon Stillman: Before we talk about some of your recent work, I was wondering how Philadelphia has been important to your work? Why didn’t you stay in New York City after getting your MFA? Jane Irish: I really like that you asked that! I know I am of this place, and my artwork reflects this sense of place even though it is kind of hard to talk about and kind of minimal. Something about using what is at hand, finding a history in the town you live in or are from, and then letting that history lead you around the world so that it is more informed. Indigenous for me is attending the Barnes as a student at 16 and living through the historical changes in my city. The Vietnam Veterans Against the War (VVAW) was very active in Philadelphia, with performative actions at the Betsy Ross house for example, and their first national protest, Operation Raw, has been very influential for me [Operation Raw was a protest “march” from Morristown, NJ, to Valley Forge meant to demonstrate the horrors of the Vietnam War through guerilla theater, reenactments, readings, and community engagement. Jane Irish organized a previous show about Operation Raw in the Crane Arts building in 2005]. The Imaginative Representations of the Vietnam War Collection at LaSalle University is a constant resource, and the only one like it in the world that traces the artistic output of the Vietnam War. GS: I found myself immediately drawn to the Resistance Ceiling, which seems to bring together a lot of your recent work, namely your work from Italy, France, and Vietnam. I was wondering if you could briefly mention the different parts of the composition and your inspiration for this piece? 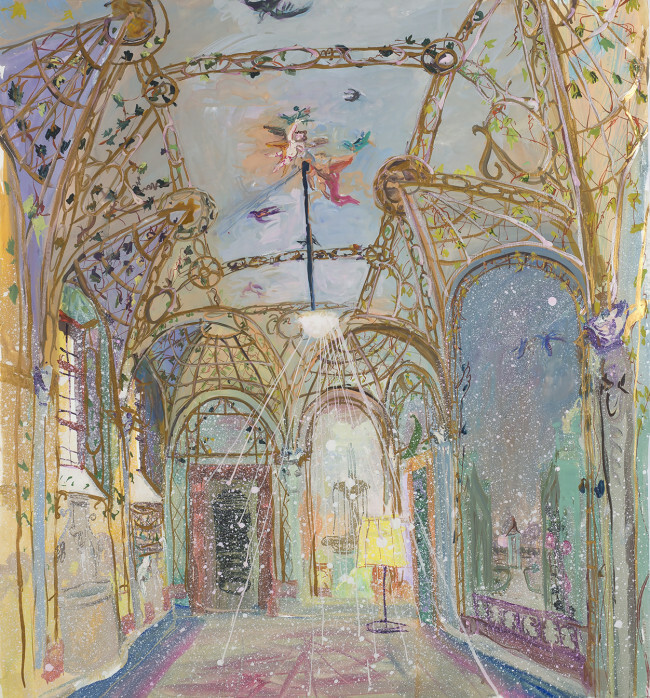 JI: I was reminded [by a friend upon seeing the ceilings from Florence] that the ceiling can be this huge mythological space, and I wanted to create a ceiling about the spiritual ideals of the anti-war, peacemaking, and resistance movements. So I set up my studio like a stage set, with panels and paintings, and paint with the natural light in my studio. 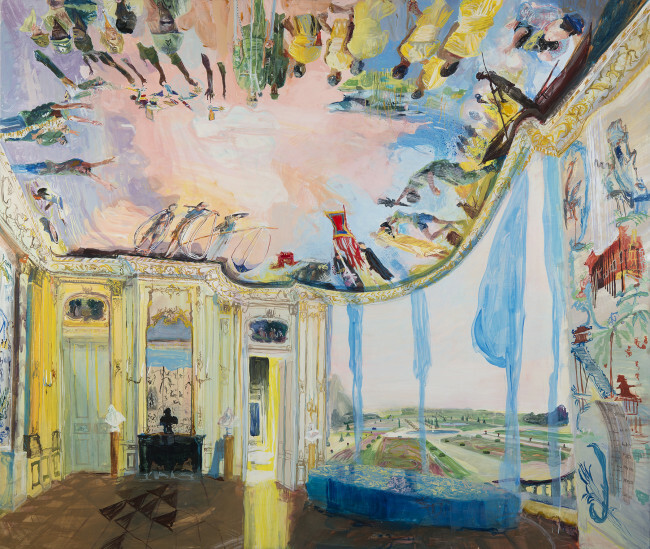 This painting combines the ceilings I painted in Florence with a French interior from the Musée Jacquemart-André in Paris, gardens outside of Paris, and resistance figures––veteran protesters, monks, and other figures. 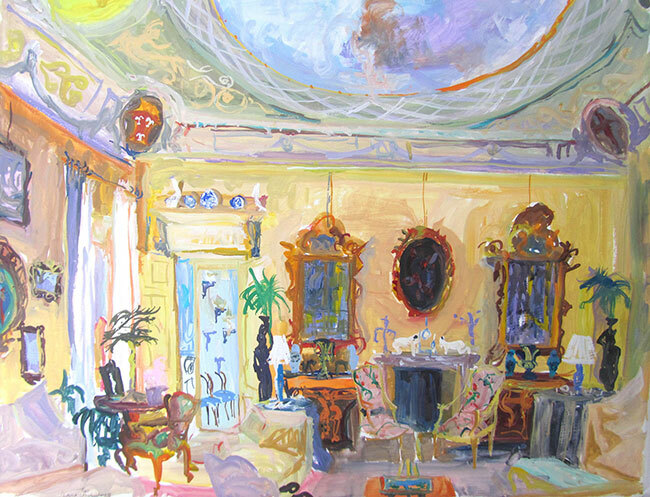 GS: I really love the figures in the ceiling, and I recognize a few of them from previous paintings you have completed. I am drawn to this notion of combining paintings and repainting them because I see it as creating new relationships not only within your work, but between the people and places in it. JI: It’s really fun to make a painting off a painting because you can imitate and also change your own hand. Another important aspect to my work is that my work comes from my experience and personal connections. I paint from the motifs for real. I meet the poets for real, the Vietnamese artists, the scholars, the French writers and colonialists. I am served by the butler of an Italian Baroness and I am mentored by anti-war veterans. I somehow tap the tales told to me into my brushstrokes. Sometimes you just pick things up that you experience firsthand. I am a receptor, and I have collected these ideas on power and resistance, and when I see something that inspires it, it gets into my work. GS: The VVAW peace movements, France, and Vietnam are all things you continue to reference in your paintings, but Italy is relatively new. What are some of the ideas that you continue to work with? JI: In Italy –– I don’t really look at Italian artists, besides Titian –– I was surrounded by the history of composition, the birthplace of it, and so this definitely affected my work. I’ve been working with the same storyline, but it has been ten years (just as long as the VVAW peace movement lasted). All artists have this one thing that they are trying to make more relevant to our present history–mine is to show the continued relevance of resistance and peace movements from the Vietnam War era. GS: So the ceramic bowls bring us back to this era and to Vietnam. The press release for the show states that these bowls were a new shape for you. Where did that inspiration come from? JI: I originally saw this shape bowl in Bat Trang, Hanoi. It is a ceremonial bowl style and these bowls are full-scale models of ones I propose to make. 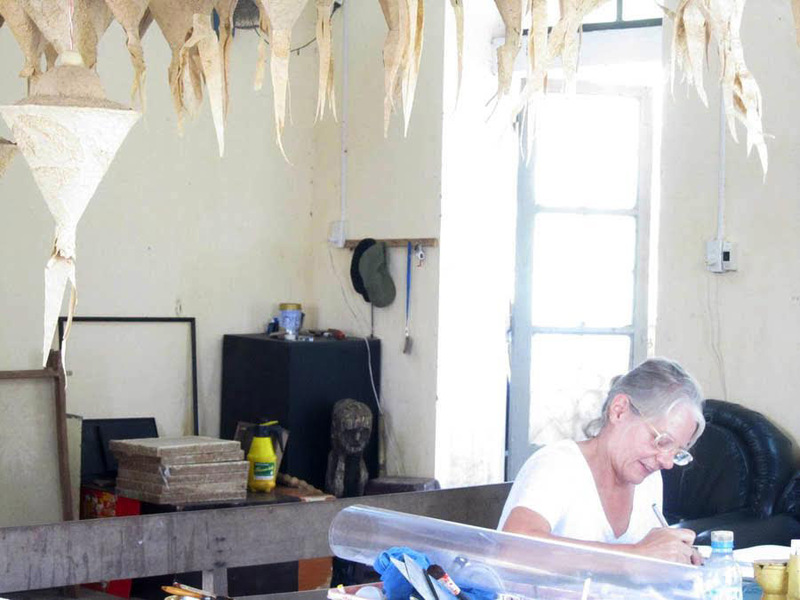 Vu Kim Thu, an artist from Hanoi, is helping me set up a residency in Bat Trang. There are many small ceramic companies in this handicraft village that I visited on my second trip to Vietnam. Young Vietnamese artists are beginning to collaborate with the craftsman, and I wanted to show the potential of my project, so I worked on the prototype bowls in this show with Philadelphia ceramicist Ryan Greenheck. The shape also reminds me that many anti-war protests happened outside in natural amphitheaters, like the bowl at Valley Forge where Operation Raw finished. This gave them natural areas to perform their acts of protest for an audience. I did these bowls in pairs, with matching styling and motifs inspired by Vietnamese faience pottery and painted scenes from VVAW protests on the inside of one bowl, while I painted scenes from Hoa Lu Ancient Capital in the matching bowl [for example, a ceremonial arch]. GS: How did you decide on the motifs for the matching bowls? 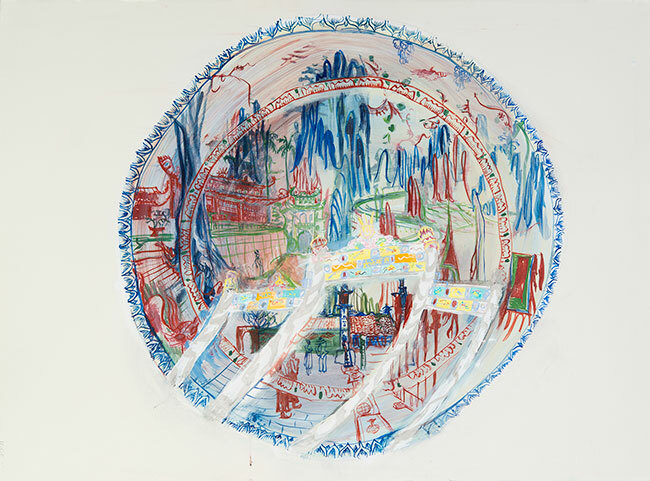 JI: I start my ceramics with a pattern book, to take something I’ve done in painting and put it on a bowl and create the whole dialogue between the arts myself. The general trajectory that moves me to make a body of work in ceramics is that I am not just critiquing the patriarchy but making pieces that try to correct the paternalism I see in decorative arts. I am interested in focusing on peace, on the spirit of the VVAW, and questioning the dominant narrative. My source of inspiration in the decorative arts gives me license to repeat myself, and also lets me question my own work. GS: So now I want to move forward, to think about the future, since you just retired from your job at Penn. Florence was a new location for your work, and it was suggested by Carl Brandon Strehlke, a friend, curator, and member of your community. Is there anyone else in your community you would like to reconnect with or work with in some new way? Any big projects coming up? JI: Well, I’ve spoken with an arts social practice program in Philadelphia developing a program that may take place this coming Labor Day (Monday, September 7, 2015) which is the 45th anniversary of Operation Raw. I also hope to visit New York more and see what happens, and return to Bretagne [France] and paint La Chipaudiere and Le Puit Savage. Make bowls at Bat Trang, Hanoi, and show at Art Vietnam Gallery. Think of a project for New Space Arts Foundation in Hue, Vietnam, where I have been offered a stay with the Le Brothers at their residency.